FAIRFIELD, Conn. (December 10, 2018)—The Fairfield University Art Museum (FUAM) is pleased to announce its upcoming exhibition, A French Affair: Drawings and Paintings from The Horvitz Collection, which will be on view from January 25 through March 29, 2019, in the museum’s Bellarmine Hall Galleries in Bellarmine Hall on the campus of Fairfield University. Produced by some of the most prominent artists of the Renaissance, Baroque, Rococo and Neoclassical epochs, the 80 works on view comprise two separate exhibitions— Imaging Text: Drawings for French Book Illustration and Seventeenth and Eighteenth-Century French Paintings . All come from The Horvitz Collection, one of the world’s finest and most distinguished holdings of French art. History, mythology, poetry, portraiture, and everyday life provided a vast storehouse of subject matter for French artists from the 16th through the mid-19th centuries. A French Affair features paintings and drawings in all these genres by celebrated artists such as Charles Le Brun, Nicolas de Largillière, Jean-Honoré Fragonard, Jean-Baptiste Oudry and Anne-Louis Girodet de Roucy Trioson. The impressive selection of 70 drawings, some exhibited with related prints, focuses on a particular category—designs for book illustration—thereby highlighting not only the creative inventiveness of the artists who formulated lavish visual imagery from the written word, but also the rich literary traditions of France and the vibrant book publishing industry they spawned. 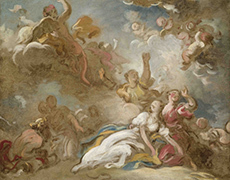 "It is a privilege for the Fairfield University Art Museum to present this captivating array of paintings and drawings by some of the leading protagonists of French art of the ancien régime and post-Revolutionary period, lent by the renowned Horvitz Collection," said Linda Wolk-Simon, Frank and Clara Meditz Director and Chief Curator. Particularly rich is the drawings exhibition component of this two-part presentation, "Imaging Text," which highlights for visitors the importance of book illustration and the robust publishing trade in France as a catalyst for artistic invention. The new prominence of illustrations in printed books, and the heightened demand for draftsmen to produce such images, offered many artists entree into elite artistic, literary, and social circles beginning in the late 17th century. The choice selection of paintings from the same moment, with their bravura handling of light and color and masterful depictions of human form and inanimate objects, speaks to the rigorous artistic training and traditions, promoted by the French Academy and the Salon (the official annual art exhibition), in which all artists of the period—painters, sculptors, draftsmen, printmakers—were schooled. Renowned for its breadth and quality, The Horvitz collection has been the focus of many national and international exhibitions and scholarly publications, and it now contains nearly 2,000 drawings, paintings, and sculptures. The exhibition is curated by Alvin L. Clark, Jr., Curator, The Horvitz Collection and the J.E. Horvitz Consultative Curator Emeritus, Department of Drawings, Division of European and American Art, Harvard Art Museums/Fogg. An illustrated catalogue of the drawings ($10) is available. Generous support for the exhibition is provided by the Robert and Mercedes Eichholz Foundation. TownVibe is the exclusive media sponsor of the museum’s 2018-19 season in the Bellarmine Hall Galleries. In conjunction with the exhibition, the Fairfield University Art Museum has organized a full roster of public programs. Thursday, January 24, 5:00 p.m. Collecting French Art: A Conversation with Jeffrey Horvitz and Alvin L. Clark Jr.
Thursday, January 24, 6-7:30 p.m.
Thursday, February 7, 11:00 a.m.
Tuesday, February 12, 6-7:30 p.m.
Thursday, February 21, 5:00 p.m.
Wednesday, February 27, 7-9:00 p.m. Drawing materials and light refreshments will be provided. Wednesday, March 6, 5:00 p.m.
All events are free of charge and open to the public. Advance registration is recommended. For more information on the exhibition and related programs and to register for events, visit the museum’s website: fairfield.edu/museum . Photo credit: Jean-Honoré Fragonard (1732-1806), Death of Cleopatra. ©The Horvitz Collection. Photo: Michael Gould. Fairfield University is a modern, Jesuit Catholic university rooted in one of the world’s oldest intellectual and spiritual traditions. More than 5,000 undergraduate and graduate students from the U.S. and across the globe are pursuing degrees in the University’s five schools. Fairfield embraces a liberal humanistic approach to education, encouraging critical thinking, cultivating free and open inquiry, and fostering ethical and religious values. The University is located on a stunning 200-acre campus on the scenic Connecticut coast just an hour from New York City.